Airport food has come a long way. During my youth I would fly out of the Moline International Airport. I am not quite sure how they can call it an international airport, maybe someone went to Canada once from there. It is a very small airport filled with very friendly employees, free parking (at least it used to be), and one baggage carrousel. There was one restaurant option right before security that basically served diner food. They have totally remodeled the airport in recent years so I might be wrong on some of this information. Nowadays I fly out of O’Hare where there are endless food options. Unfortunately, that also comes with about 10x the hassle when compared to flying out of a small airport. San Francisco’s airport (SFO) has a new terminal that is filled with awesome options. Cat Cora and Tyler Florence both of restaurants there, as well as an amazing candy store, and Pinkberry frozen yogurt. You don’t mind killing time in that terminal. I recently flew out of SFO after an amazing trip to California and had some time to kill in the new terminal. I decided to get lunch at Tyler Florence’s restaurant. It is a relatively casual place that serves pizza, salads, and rotisserie options. I had a salad but I was really eyeing the creamy succotash side dish. I decided to try my hand at it when I got home. I think I waited a whole two days. 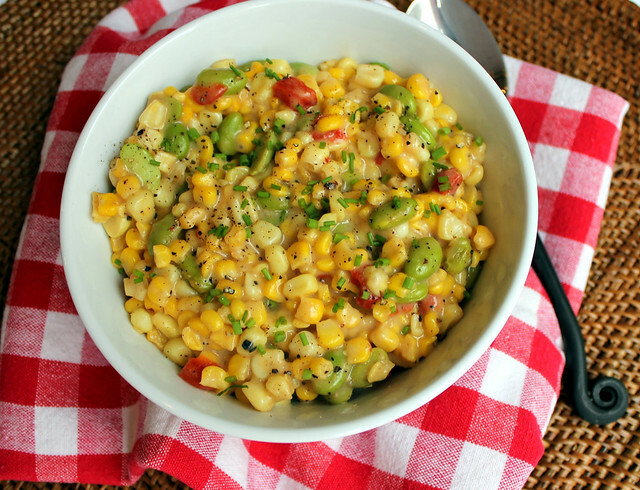 Google tells me that succotash is a dish of corn and lima beans. Well, mine has one of those things. I subbed lima beans for edamame, added roasted red peppers, and a spicy cheese sauce. My original plan was to use shredded pepper jack cheese in the sauce but while grocery shopping I spotted a chipotle cheddar cheese and decided to go with that. I loved the smoky flavor of the chipotle peppers, but pepper jack would also be great in this dish. This is a great way to spruce up your standard veggie side dish. I loved it! Melt the butter over low heat in a large skillet, whisk in the flour until it forms a paste. Slowly add the milk, whisking constantly. Turn up heat to medium and whisk until the white sauce has thickened and starts to bubble. Add the dry mustard, seasoned salt, and pepper, whisk to combine. Stir in the shredded cheese and hot sauce. Taste and adjust seasonings to preference. 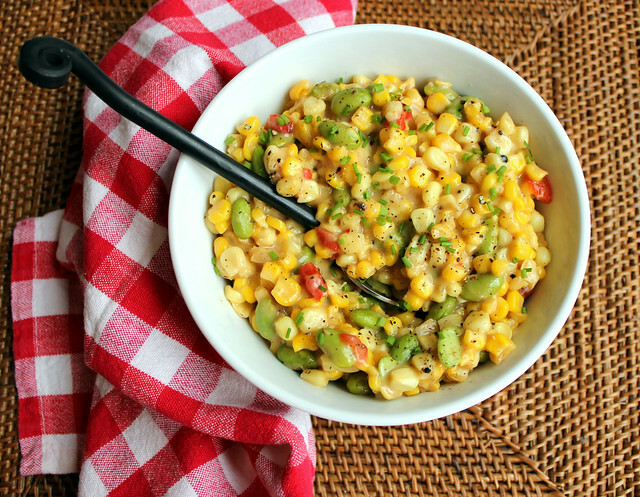 Stir in the corn, edamame, and roasted red peppers until coated in the white sauce. Cook until the mixture is heated throughout.